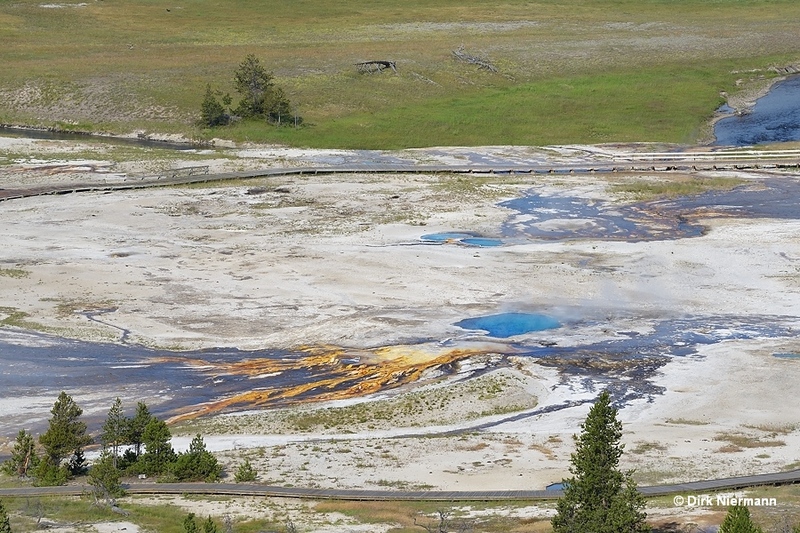 Online tours around Geyser Hill and adjacent groups are also to be found elsewhere on the web, not least on the official Yellowstone pages. Nevertheless, I decided to include it here in order to add some different viewpoints and to gain a little bit more completeness on this page. 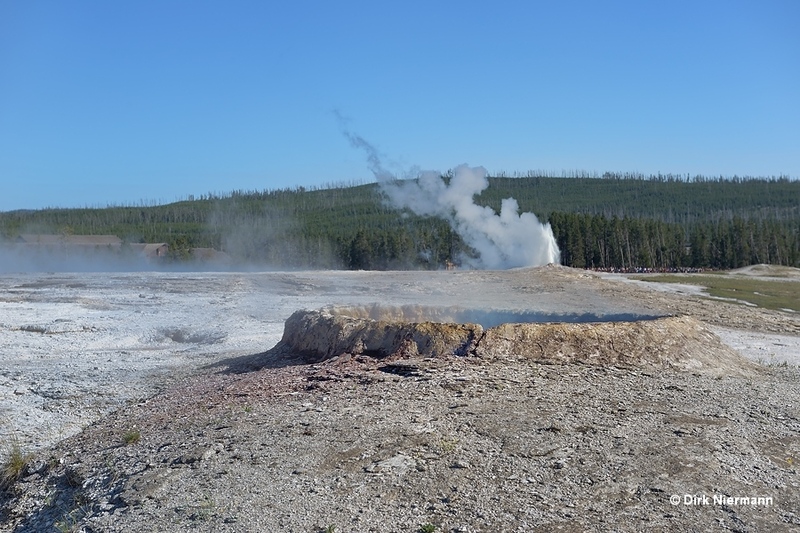 Geyser Hill is the name of the elevated area across Firehole River from Old Faithful Geyser. 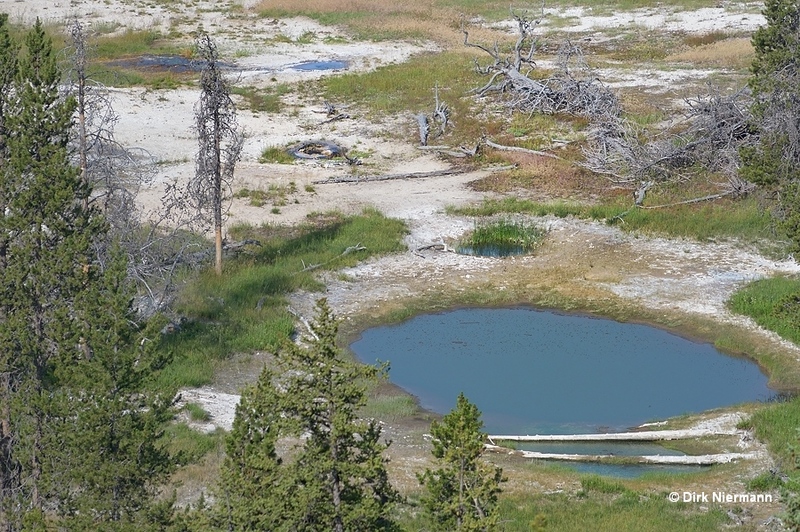 With over 50 geysers it's one of the most important hydrothermal spots in Yellowstone and also worldwide. Visitors are guided by a loop trail consisting of boardwalks. 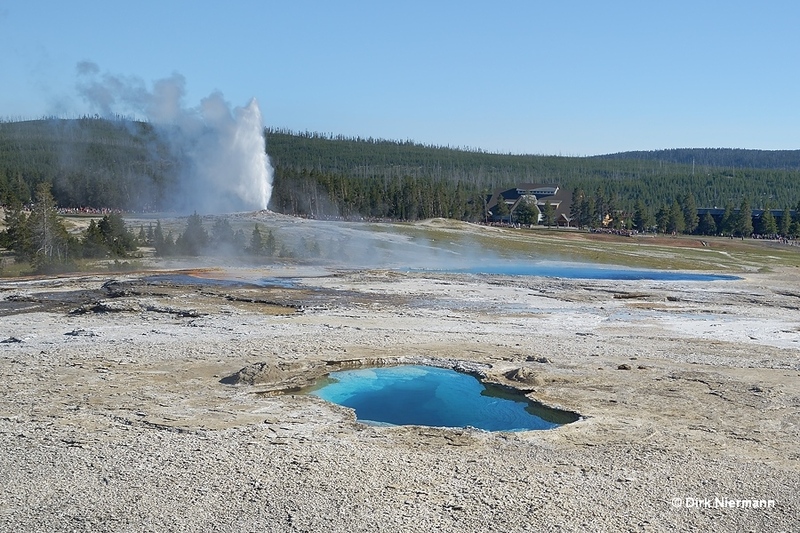 Coming from Old Faithful Geyser and walking counterclockwise, the first feature you come across on the right hand side of the trail is Dome Geyser. 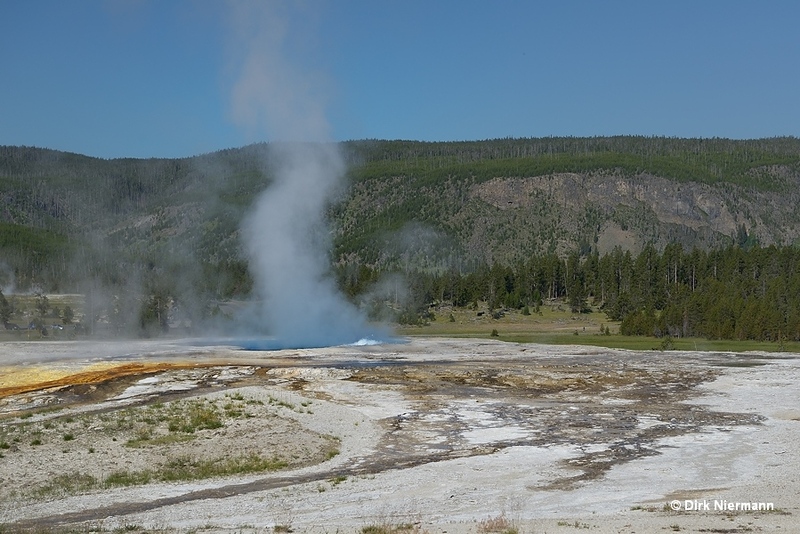 More precisely, only the huge sinter mound of Dome Geyser is visible from the boardwalk. 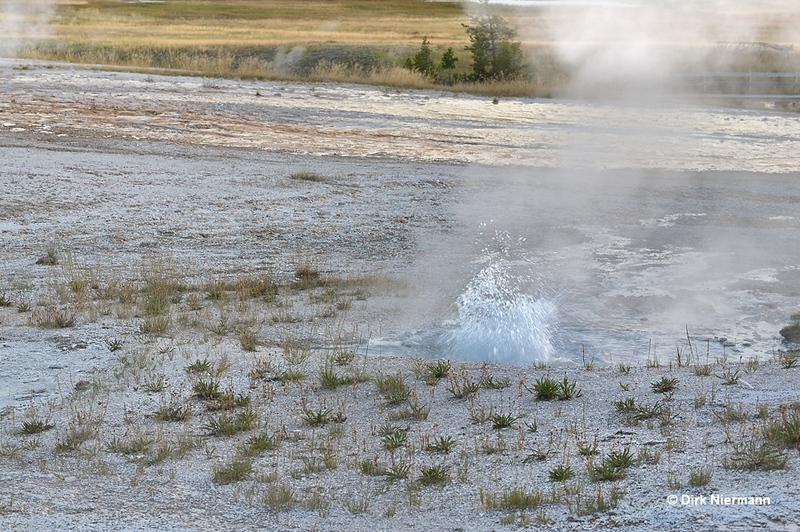 Active periods of Dome Geyser may span several days, interrupted by quiet phases of some days up to weeks. The duration of the play ranges between some minutes and half an hour or even more, and almost always the first burst is the largest, reaching up to 9 m (30 feet). However, dormancies as long as many years are also known. 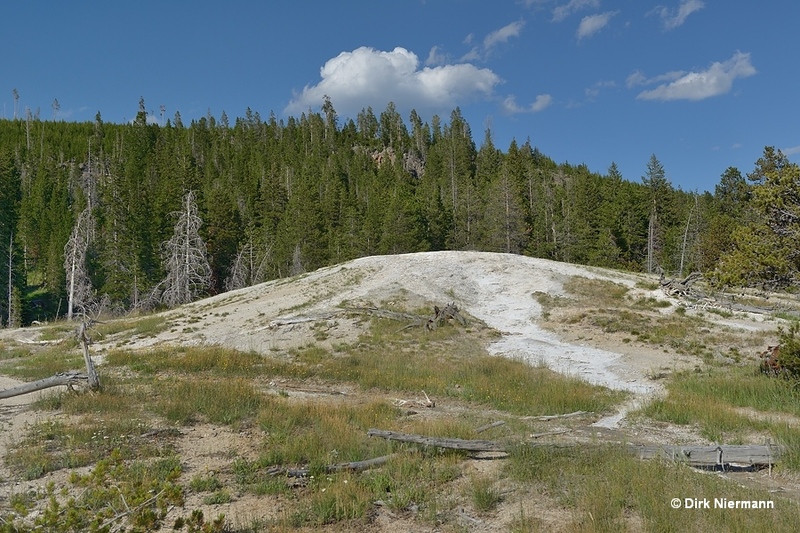 To spot the impressive bowl of Dome Geyser you have to climb the hill in the northeast to Observation Point. 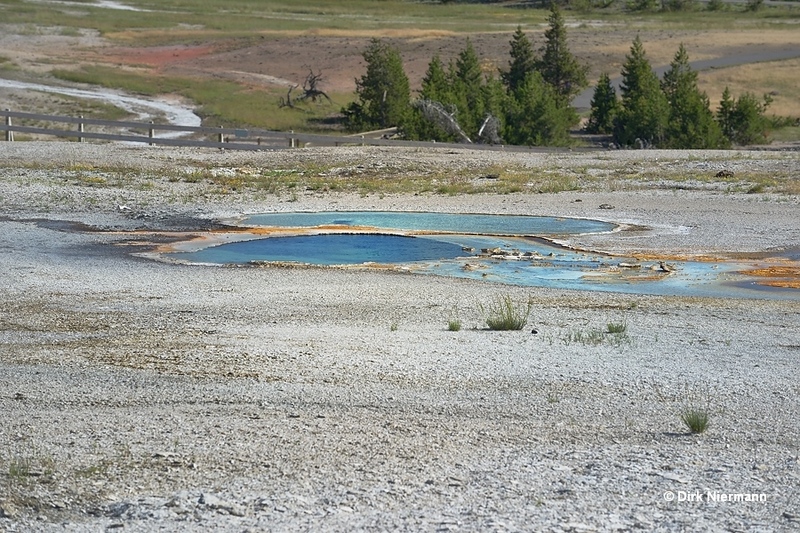 Northwest of Dome Geyser both Peanut Pool and Butterfly Spring don't gain much attention due to their low visibility. 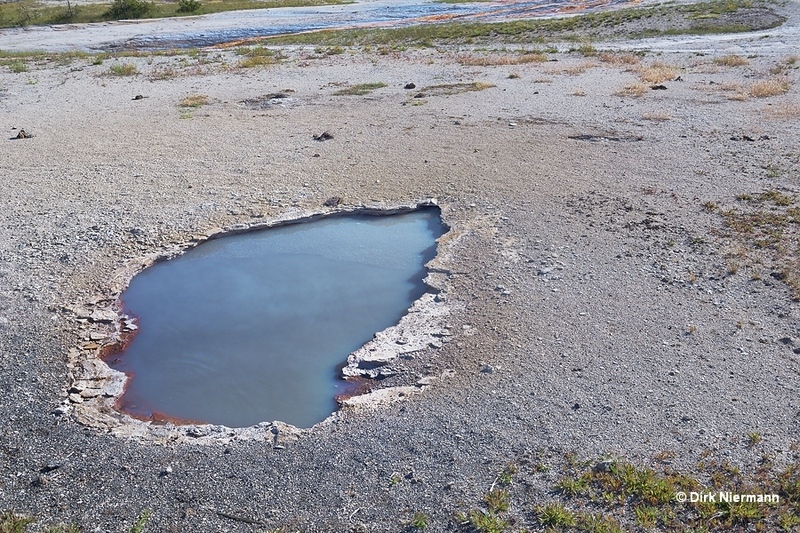 Peanut Pool, closer to the boardwalk, is a rarely active and weak spouting geyser, which seems to depend on Butterfly Spring. The latter had eruptions up to 15 m (50 feet) high in May 2003, but reduced its play thereafter to a more or less continuous, low splashing. 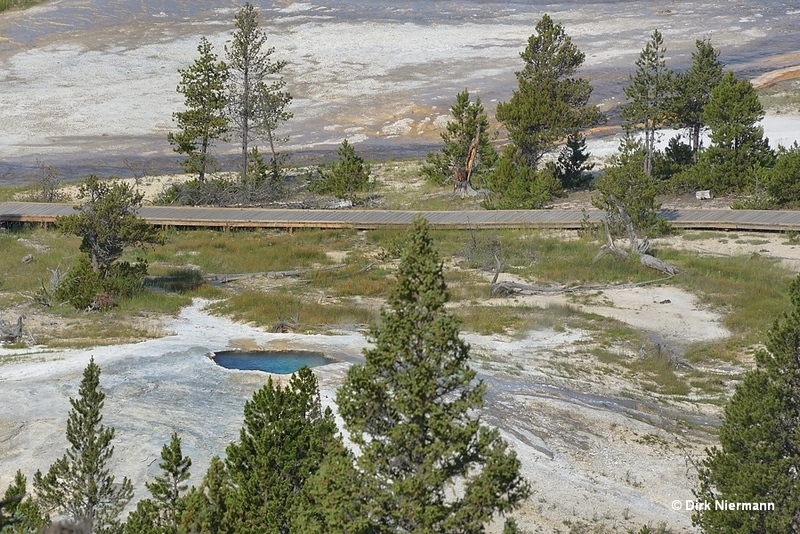 Like Dome Geyser, Butterfly's crater can only be seen from the Observation Point, while rim and runoff of Peanut Pool are also visible from the boardwalk. 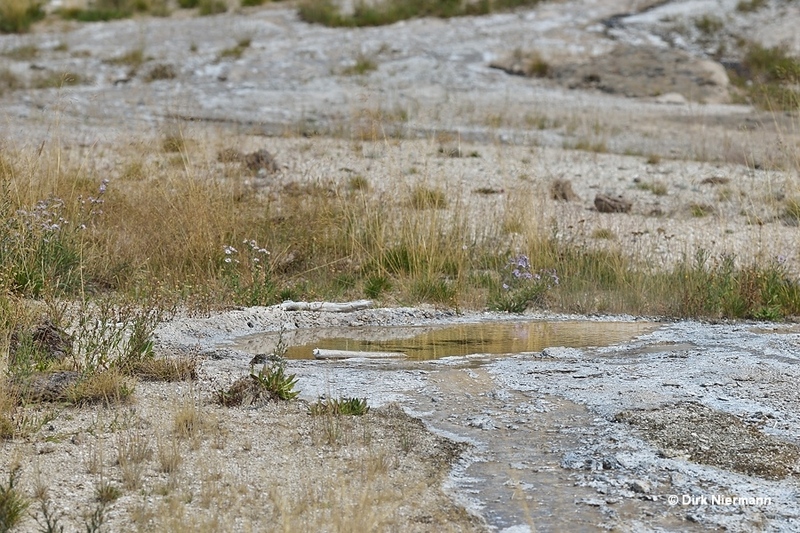 Infant Geyser, across the boardwalk from Peanut Pool, once was an alkaline, crystal clear geyser, erupting a few feet high simultaneously with Giantess Geyser. 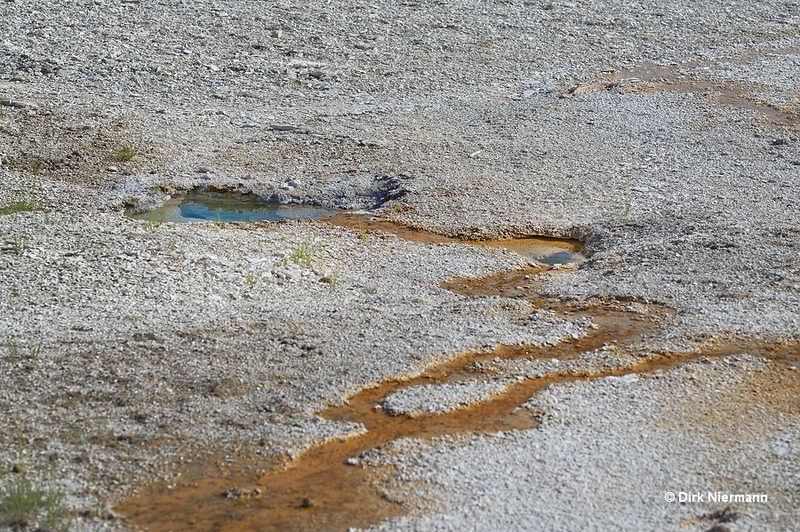 In 1964 the water chemistry changed from alkaline to acidic, causing a muddy gray appearance and Infant no longer showed eruptions. The tallest geyser on Geyser Hill and one of the largest worldwide with eruption heights up to 60 m (200 feet) is Giantess Geyser. However, it is erupting only a few times per year on average. 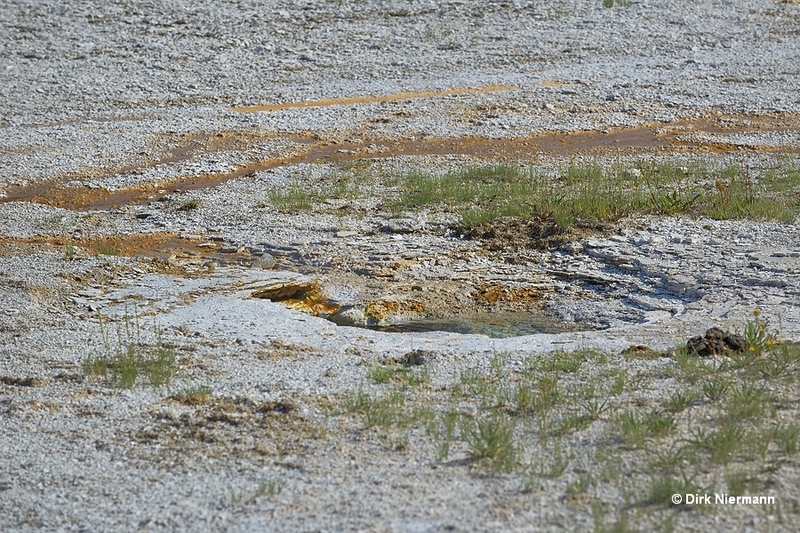 Far more common is a periodical boiling near the crater rim, as to be seen on the photo. 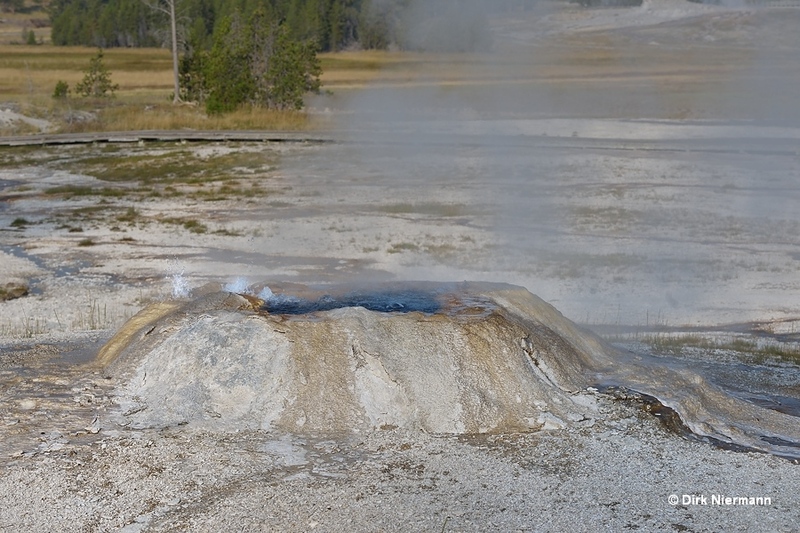 The Observation Point also provides a look into Giantess Geyser's bowl. 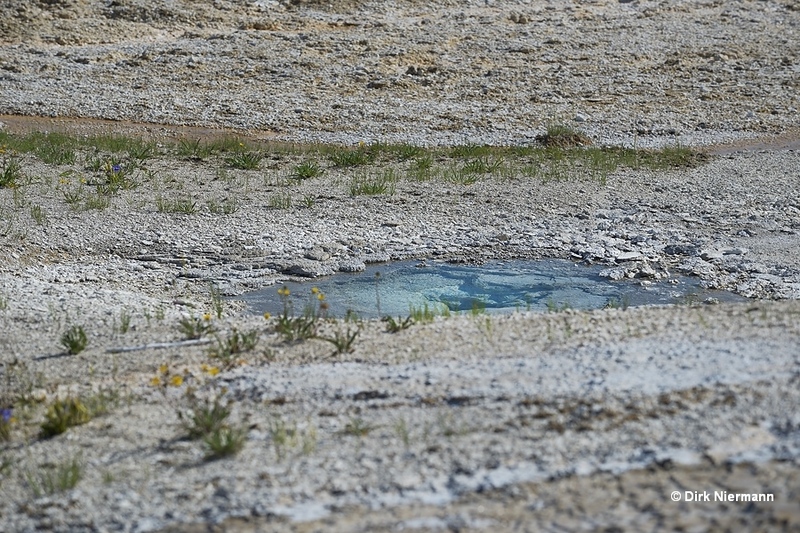 Located close to Giantess, Vault Spring plays up to 6 m (20 feet) high during a Giantess eruption. Rarely also idependent activity has been recorded. Vaults neighbor to the west is the solely boiling Teakettle Spring. Past Teakettle the elevated position of the boardwalk allows a glimpse of Dragon Geyser at some distance. Eruptions of Dragon Geyser are extremely rare. Nearly half way between Dragon Geyser and Giantess Geyser the small Model Geyser can be spotted. It erupts at intervals of 5 to 20 minutes up to 1 m (4 feet) high. 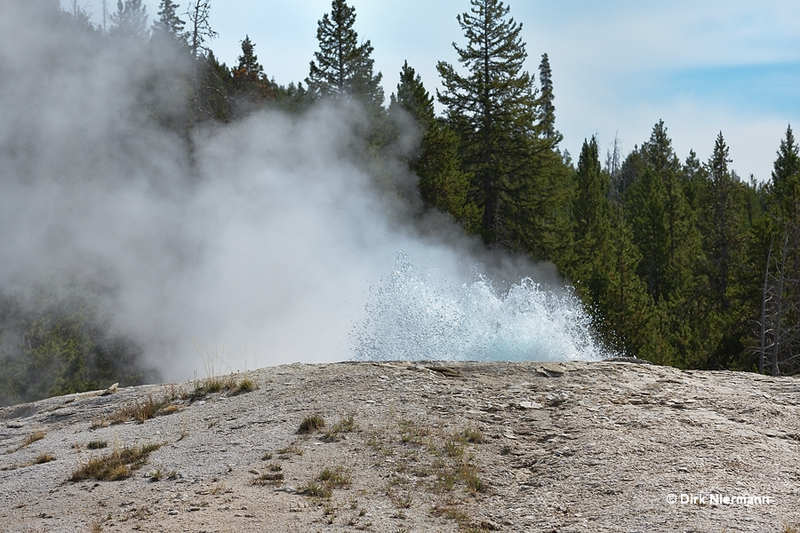 The next eye-catching feature along the trail is Sponge Geyser. Although its frequent eruptions do only reach some centimeters / inches, it is officially accepted as a geyser. Note the small water spurt on top of the left rim, it doesn't emerge from the pool but from a separate vent embedded in the rim. In the field beyond Sponge Geyser a number of further small geysers can be observed. 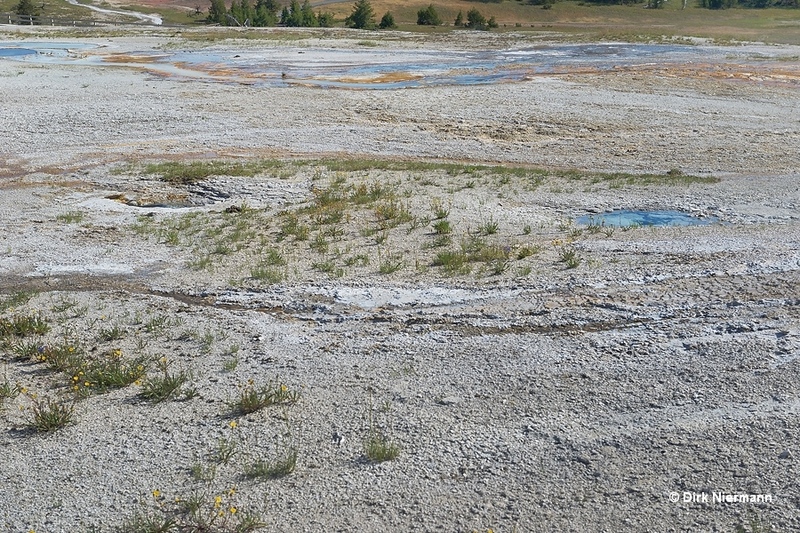 Most obvious are the craters of Slot Geyser and Plate Geyser. 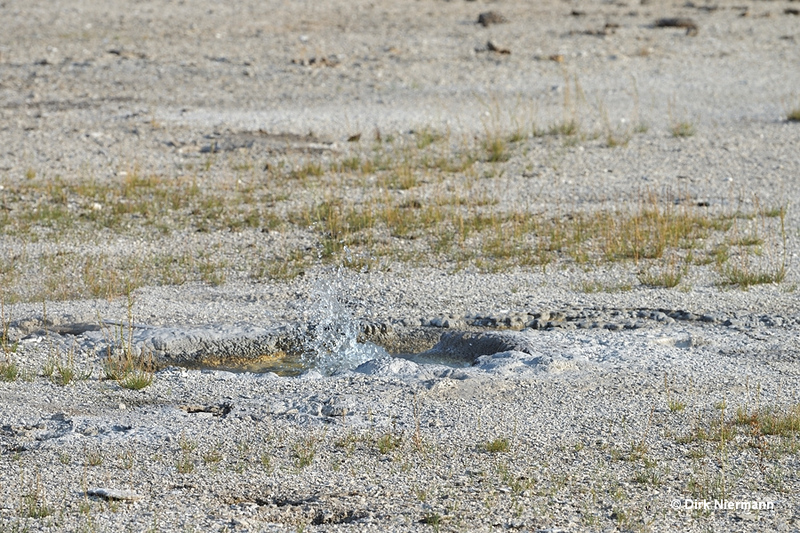 Plate Geyser has been formed by the 1959 earthquake and is a quite irregular performer, playing up to 3 m (15 feet) high. Like Plate also Slot Geyser is rarely seen playing, with heights of 1 m (3 feet). The vent is hidden in the crack (slot) on the left side of the small pool. About 4 m (12 feet) to the east from Slot Geyser the vent of Boardwalk Geyser shows up, which was active from 1992 to 2006.